Do you hear clicking or popping when you open or close your jaw? Maybe you have frequent headaches or have trouble chewing? If so, you may be suffering from a disorder of the temporomandibular joint, commonly referred to as TMJ Disorder. It is estimated 10 million Americans suffer from a TMJ disorder, which causes many painful and uncomfortable symptoms. It is believed that 80% of all headaches are due to the teeth. While the causes of the disorder can vary, it is essential to seek treatment because complications can develop. We provide assessment and treatment for TMJ in Randolph to improve jaw function while reducing the symptoms of the disorder. TMJ can be caused from several factors, such as a traumatic injury to the jaw, teeth grinding, poor teeth alignment, arthritis, and may other factors that hurt the function of the jaw. When the temporomandibular joint functions incorrectly, it is not uncommon to hear clicking, popping, or grinding sounds when opening and closing the mouth. In some cases, the jaw may even get locked into an open or closed position. The symptoms of the condition can extend to other areas as well, leading to headaches, facial pain, ear pain, neck and back pain as well as pressure in the ears. When left untreated, your quality of life will decrease as it becomes challenging to do simple tasks like eating, speaking and sleeping. Not to mention, if the disorder is causing excessive force on the teeth, your teeth can become weakened, broken, and loose. For minor cases of TMJ, you can try home treatments to improve the flexibility of the jaw. This involves daily exercises while also decreasing unnecessary force on the joint, such as avoiding hard foods. When home treatment is not enough, you will need the help from Dr. Goldstein who specializes in TMJ at Randolph Dental Care. Dr. Goldstein has extensively trained in the subject of identifying and treating TMJ disorder. Treating TMJ can involve several different paths. An initial examination is performed to access the jaw’s function. We will also use diagnostic images such as X-rays, CT scans, MRI’s and check the alignment of your bite to create a treatment plan. Treatment for the condition can take many forms including appliance therapy, orthodontics to realign the teeth, reshaping the teeth or restoring the teeth. If the disorder is caused from an underlying condition like Bruxism, a mouthguard can be used to help reduce the pressure on the joint. Often, we may recommend more than one form of treatment to help restore proper function of the joint. In addition to treating the disorder, we will also repair any damage that may have occurred to the teeth due to the condition. 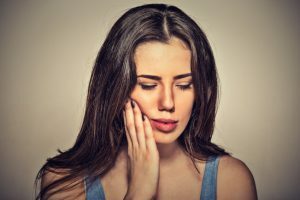 If you have been living with jaw pain or unexplained headaches and home remedies are not producing any results, it is time to call Randolph Dental Care for a TMJ assessment. We will evaluate your jaw and bite while discussing the symptoms you have been experiencing. With the right diagnosis, we will recommend the most effective course of treatment to stop the pain. If you are ready to enjoy a life without the pain of a TMJ disorder, contact our office today to schedule a consultation.